This storywas updated Aug. 26 at 12 a.m. ET. NASA isexpected to make a major announcement today on the progress of its Keplerspacecraft, which has been staring at one patch of space for evidence of otherworlds. Participatingin the teleconference will be senior NASA scientists and Kepler missionresearchers, including principal investigator William Borucki of ?the spaceagency's Ames Research Center in Moffett Field, Calif. The Keplerspace observatory hunts for Earth-likeplanets around other stars. In June, mission scientists announced that thetelescope had found over 700 candidates, including five systems that appearto have more than one transiting planet. The spacecraftmonitors stars for subtle changes in their brightness, which could indicatethat alien planets are passing in front of them as seenfrom Earth. To date, astronomers have discovered more than 400 extrasolar planetsaround stars beyond our solar system. 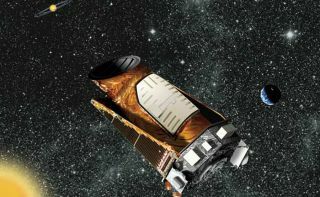 NASA launchedthe $600 million Kepler spacecraft in March 2009. It is currently staring at apatch of the Milky Way that contains over 156,000 stars ? a star field in theconstellations Cygnus and Lyra. Astronomershave been using the data from Kepler to determine whether orbiting planets areresponsible for the variation in brightness of several hundred stars. Follow-upobservations are necessary to distinguish between actual planets and falsealarms such as binary stars, which are two stars that orbit eachother. Today'sannouncement comes on the heels of a separate discoveryof at least five planets ? with hints of two more ? circling around a starin an arrangement similar to our own solar system. Thatdiscovery (which included up to seven alien planets ? including one that couldbe 1.4 times the mass of Earth) was made by astronomers using the EuropeanSouthern Observatory in Chile. They discovered the planets 127 light-years fromEarth around the star HD 10180 in a pattern that looks strikingly like oursolar system, only in a more compact arrangement.